The one thing that sets apart Cram from other application is that it compresses images but it does not affect the image quality. Yes, you heard it right! If you are low on storage, then this application will definitely free up some space for you by compressing the selected images but it will not affect the image quality at all!! Cram – Reduce Pictures is very simple and easy to use application. When you will start this application for the first time it will take you through a step by step tutorial. You can either skip this tutorial or go through it in order to understand the application. Once you are done with the tutorial, click on cram it and tap start to initiate the image compression. Application will now ask you to select the images from your gallery. Select the desired images and let this amazing application do some wonders for you. Once the image compression process is completed, you can completely delete the original images from your gallery to free up some space. The setting menu offers a lot of different options. It gives you the freedom to set the quality of the compressed image, allow CRAM to automatically compress the images as soon as you capture them, also gives the option to auto delete the original images once they are compressed and much more. 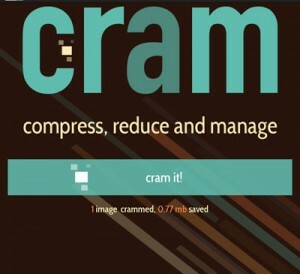 Cram; a very useful application comes with option to compress only 300 images with the free version. You can spend some money to compress more images. Moreover, if you give them a shout out on Twitter they will allow you to compress 100 more images free of cost. For us this application came out as a surprise. We have used different image compressing application on Android in past but CRAM is definitely the best. It reduces the size by 50% and does not affect the quality of image! This is amazing! App is available on Google Play and iOS “App Store”.